Just in case you didn’t know, the nib is that thing at the end of the pen which you use to draw or write. Oh boy, I immediately noticed the difference! Everything’s so smooooth… too smooth now actually since I’ve gotten used to the old nib (I’ll get over it). And I don’t know why, but drawing is now more fun, quicker, and accurate. Huge time saver definitely; looking back, I had to redraw a lot (draw a line, erase/undo, draw line again until I get it right, etc.) 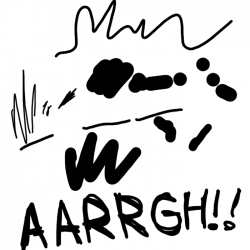 because the sharper point of the older Wacom pen nib makes my strokes a little wobbly. Now I don’t have to do that often anymore! I kinda feel stupid that it took all this time. I mean, obviously, if your pencil’s starting to become too short to be useful it’s time to replace it, but whatever! I’ll certainly stock up on the nibs (some Amazon links below) and change them from now on whenever it becomes too dull, and you should too! I think a year or so is a good time to replace it. Now, if I can only do something about Adobe Flash’s long saving times then everything would be peachy. I save often cause it crashes often. Hmm, perhaps getting an SSD will help but those things are kind of expensive. Of course, there’s a way to help out with that wiiiink. Finally, here’s a quick guide to purchasing nibs and some links to Amazon if you want to shop for them. Always remember to check first if they’re compatible with your drawing tablet before buying! And I’m an Amazon associate, so if you buy any stuff through these links, I’ll also earn money without any additional cost to you, so thank you! Wacom Wacom Pen Nib In Black (5 Pack) – The standard nib that comes with all pens. 10 Pack Replacement of Wacom Pen Standard Nib Black Stylus – Seems like a better deal than the above, but not directly sold by Wacom. Wacom ACK-20003 Hard Felt Nib – Felt nibs have higher friction for a more “pencil on paper” feel. If you don’t have these, why not try them out? Wacom Flex Nibs for Intuos, Bamboo, Cintiq Classic, Cintiq Grip, Graphire Tablet Stylus Digital Pens, 5-Pack – Black – ACK20004 – Flexible and high-friction. Some people prefer this over the standard nib. Wacom Bamboo Replacement Nib Set (2 Standard, 2 Flex, 2 Felt) For CTL, CTH, CTE, INTUOS – 2 pcs. of each nib (standard, felt, flex). A good buy if you want to try the flex and felt nibs for yourself. Wacom Intuos 4 Replacement Stroke Pen Nibs,Gray,Pack of 5 ACK20002 – Stroke pen nibs have dual-springs for a more brush-like effect. 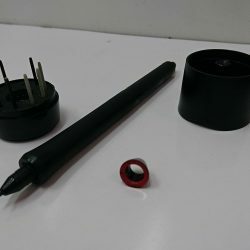 INTUOS4 Pen Pro Accessory Kit – Seems like a decent kit though it only has 1 standard nib included.